On Thursday 8th September 2016 Cheltenham Minster opened its doors for Heritage Open Day for the first time. This was specifically so that visitors could Watch the Bell Ringers. A camera was placed in the bell chamber, and another in the ringing room. A wire was run through the floor down to the church and a screen erected so that the ringing could be seen from downstairs. 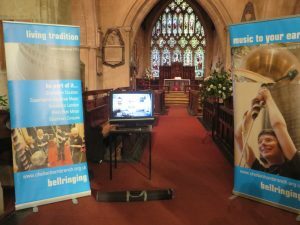 The bell ringers then had their practice from 6pm until 8pm and the Friends of the Minster provided refreshments in the church.